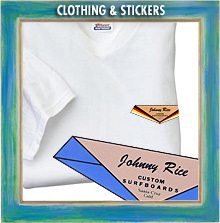 If you're a longboard soul surfer or a guy that really shreds the waves with a short board, Johnny know waves and water. 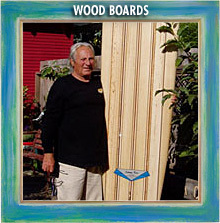 With his 50+ years of knowledge, he then take your personal wave riding style and physical characteristics, combines and translates them, into your finished product. 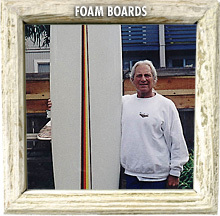 Whether it's wood, foam or epoxy, longboard, shortboard or funboard, check out the many kinds that Johnny personally hand-crafts and designs --- each to suit whatever flavor of riding style you prefer. 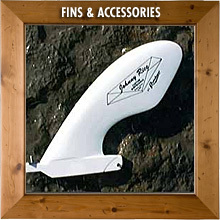 He also stocks Rainbow® fins designed by Johnny Rice... check 'em out and buy them here. 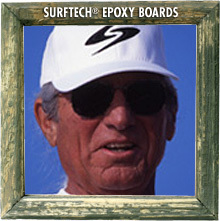 So whether you're a veteran waterman or just starting out in surfing, drop Johnny a line to talk shop. Click on any image below for more info. Although, the photos don't do them justice. You have to see and hold each board to see the quality in craftsmanship.